Originally, the kitchen and living room were separated by a 14 foot wall. The pantry rested under the stairway and was accessed through the laundry room. Linoleum flooring and original cabinets gave this kitchen an outdated look. Our company removed the dividing wall and installed the beam to support the second floor loft. We replaced everything in the kitchen from tile to ceiling fixtures. New solid wood cabinets, large pantry cabinets built in, 7’x4′ island with storage & bar seating and wainscoting. We installed the sink and dishwasher in the island with a touch sensitive faucet and deep under-mount stainless steel sink. LED recessed lighting and three pendant fixtures that match the new dining hanging fixture highlight the room. The big feature is under the stairs. 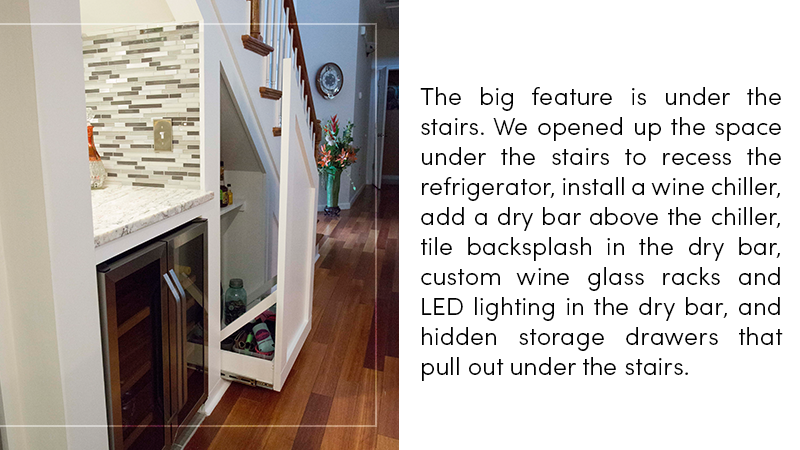 We opened up the space under the stairs to recess the refrigerator, install a wine chiller, add a dry bar above the chiller, tile backsplash in the dry bar, custom wine glass racks and led lighting in the dry bar and hidden storage drawers that pull out under the stairs. The secret drawers under the stairs look identical to the wainscoting on the opposite wall. But, when you press in on the wall lightly, the spring loaded catch releases and the wall pulls out to reveal large storage spaces inside. This space is now a full 600+square feet with the open floor plan. The living room flows seamlessly into the kitchen allowing entertaining space for 30+ people. 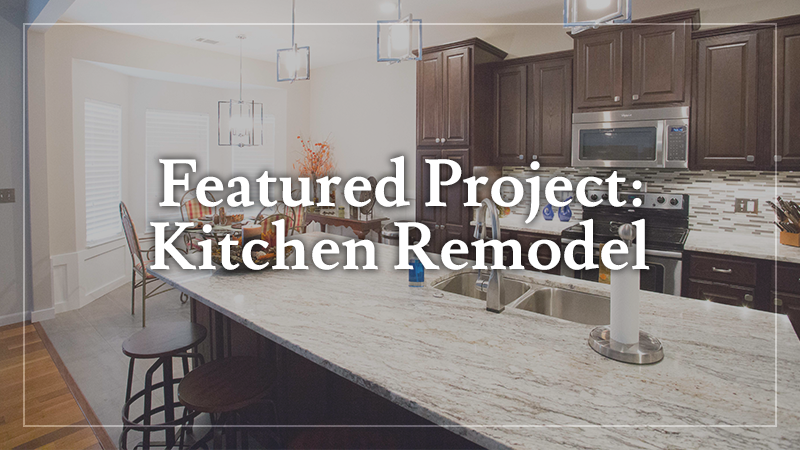 Have you always wanted a perfect kitchen but felt it was too big of a project for you to do on your own? At L & L Contractors, we can create your perfect kitchen that will make entertaining and cooking a breeze. Creating a custom kitchen is one of our specialties and we look forward to every project put on our plate. Contact us today for a free consultation!